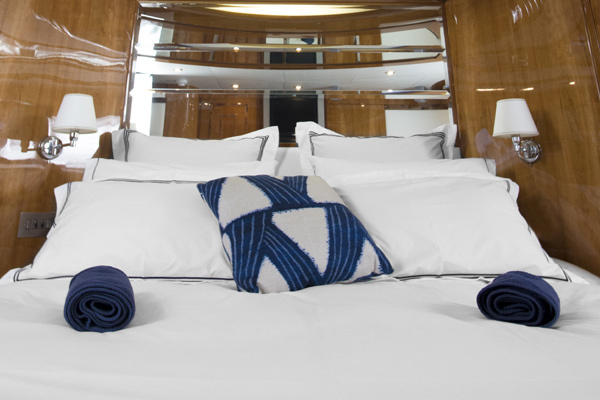 One of UAE’s most luxurious homegrown brands – Carter & White – has launched its new bespoke yacht bedlinen and bath linen collection called ‘Made to Measure’at the glamorous Cannes Yachting Festival. With its participation at the event, Carter & White become the first Dubai label to represent the emirate at the event. Since 1977, the Cannes Yachting Festival has taken place every September in elegant, luxurious surroundings in a sparkling bay of the French Riviera. As the first show in the boating season, the festival is Europe’s leading in-water boating event and the major players in pleasure yachting arrive to launch the show season by showcasing their new worldwide models. Carter & White's new ‘Made to Measure’ enables clients to choose the fabric, the embroidery and even add their initials as a personal touch to the linens. The collection is available for both yachts and the home. "We are very happy that we were part of the revered Cannes Yachting Festival; it is an honour to be the first to represent Dubai in this beautiful show,” said Marwan Al Serkal, Carter & White’s Founder. One of the esteemed visitors to the Carter & White exhibition stand was Sheikh Hasher bin Maktoum bin Juma Al Maktoum, Director General, Dubai Information Department, who showed his support for his native brand. On the back of the event, Carter & White is currently in talks with two large Italian shipyards – Benetti and Sanlorenzo – to supply boat owners with Carter & White collections. Carter & White products are exclusively made using Egyptian Giza cotton with a generous thread count that ranges from 400 to 1,200 depending on a customer’s request. Established in 2016 in Dubai, Carter & White specialises products ranging from T-shirts, undershirts, boxers, socks, to more recently bed and bath linens. The company’s Founder and Director is Marwan Bin Yousef Al Serkal, an Emirati entrepreneur with global business experience in several markets, including finance.